A new site for the Rosenbach Museum & Library, the home of Maurice Sendak, Alice in Wonderland, James Joyce, Dracula, and countless other great works of literature. 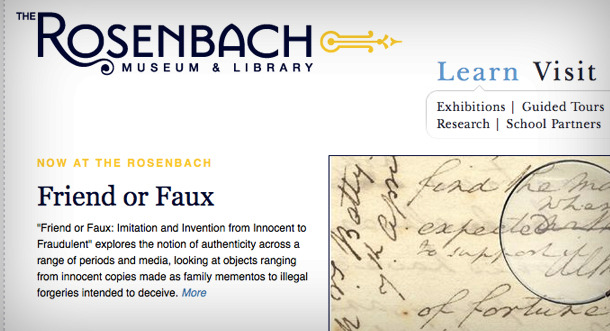 Canary designed and developed a Drupal website for the Rosenbach Museum & Library which highlights the museum’s many exhibitions and events as well as its vast collection of rare books and manuscripts. We developed a robust and detailed design vocabulary that easily differentiates the many levels and types of content. The site is targeted toward several audiences, including museum visitors (new and returning), members, families, academics and researchers, funders, and general art and history enthusiasts. We built upon Drupal’s Taxonomy system to allow site administrators to easily categorize anything they create on the site and use those categories to automatically draw connections between content across the site. This allows the site to flesh out pages with related content from other sections of the site, which helps visitors find more on the site that interests them. This in turn increases the time spent on the site, and their level of engagement with the Rosenbach.